In order to foster responsible research and innovation in the nano research and innovation (R&I) system, innovative processes are required in order to improve the responsiveness of research and innovation processes to public values and concerns, and to enhance the confidence of stakeholders that new technologies respond to societal needs and values. The early and continuous engagement of all stakeholders is key to sustainable, desirable and acceptable innovation in nanotechnologies, in which R&I is aligned with the values, needs and expectations of society. We selected some key findings from previous and ongoing EU and national engagement projects to provide recommendations for GoNano regarding methodological requirements for a multi-actor methodology optimised to foster responsiveness to societal needs, learning and collaboration. Nano2All, NanoDiode, COMPASS, and Framing Nano were specifically focused on the responsible development of nanotechnologies. NANO2ALL aims to put responsible research at the core of its methodology to create a climate of dialogue and engagement. The European Horizon2020 project NANO2ALL will create various tangible and intangible outputs and results, but most importantly insight that will allow researchers and decision-makers to engage with each other, as well as with other stakeholders and channel the feedback of their interaction into mechanisms that will reinforce the roadmap identifying research concerns and opportunities for innovation. The self-assessment tool help reducing knowledge gabs between the participants in advance of the dialogues. Therefore, it might be useful to develop a similar tool in GoNano to ensure equal level of knowledge. The use of materials in the citizen dialogue might also be relevant for the GoNano workshop: In the citizen dialogue the citizens used craft materials to build objects that symbolized their need, concern and value regarding nanotechnology and created narratives about the object. Regarding GoNano, this exercise exemplifies how materials can be in a more symbolic and abstract way than to build prototypes. It is recommendable to identify knowledge gabs among the GoNano workshop participants, and provide targeted training in advance of the workshops. Regarding to the actual workshops, it is advisable to engage participants in scenario building, as this will ensure active learning and make sure that the scenarios match their actual need, concerns and values regarding nanotechnology. In addition, it might be a good idea to provide materials that the participants can use to express their need and concerns through. Finally, it is recommendable to develop a concrete action plan for how to implement the outcomes of the GoNano in national and EU governance of nanotechnology. Stakeholder engagement and dialogue are essential to the responsible development of nanotechnologies in Europe. The European FP7 project NanoDiode, established an innovative, coordinated programme for outreach and dialogue throughout Europe so as to support the effective governance of nanotechnologies. The project integrated vital engagement activities along the innovation value chain, at the levels of research policy, research & development (R&D), and the use of nanotechnological innovations throughout society. The NanoDiode experience emphasises that getting from constructive dialogue to practical action is a major bottleneck; this is particularly salient for the GoNano co-creation initiatives. To encourage uptake, discussions should be specific enough to affect the decisions of the actors. This applies to the topic at hand (what problems are we addressing? What sort of change do we want? ), but also with respect to possible courses of action: who is the problem owner? Which actions can address the issues identified during the meeting? The FramingNano-project was a support action funded through the EU FP7. The project aimed to build a deliberative process that allowed nanotechnology stakeholders to engage in an ongoing dialogue about the governance of nanotechnology development. By focusing on risks and concerns, the project pursued both EHS (Environment, health and Safety) as well as ELSI (Ethical, legal, societal implications). The concepts of inclusiveness (where all interested stakeholders are included and invited to engage in the dialogue), transparency, public understanding and trust. These were set against an out-dated concept of “engineered consent” (or deficit model) which springs from the belief that public perception can be guided by spreading selected information. The expectations to nanotechnologies are high, but it is widely shared that the benefits promised will fully materialise only if there is a governance system which addresses, in a timely manner, the potential risks and concerns associated with their development to allow growth and technology exploitation that leads to sustainable applications. Given the nature of nanotechnologies, an effective governance approach will have to increase the level of interaction amongst those developing, producing, selling and regulating nanotechnology, as well as with civil society in general. First then it will be possible to promote a proactive and adaptive process capable of framing the development of these new technologies across known and accepted boundaries. The establishment of open, transparent, objective and trustworthy communication will also be necessary. COMPASS is an EU-funded project that supports Small and Medium-sized Enterprises (SMEs) in three emerging technology industries to manage their research, development and innovation activities in a responsible and inclusive manner. 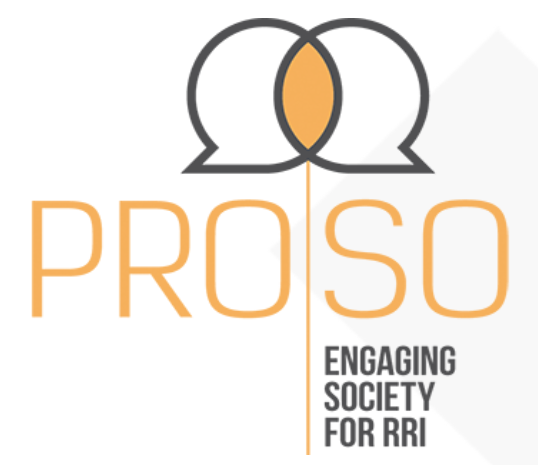 The aim of PROSO (EU Horizon2020) is to provide guidance on how to encourage engagement of citizens and third sector organizations, like non-governmental organizations (NGOs) and civil society organizations (CSOs), in Europe’s research and innovation processes. In order to identify potential barriers and incentives for CSO and citizen engagement in research and innovation the project conducted a) a comprehensive literature review, b) nine case studies of CSO engagement in the areas food & health, nanotechnology and synthetic biology, c) citizen panels in five countries, discussing the willingness of citizens to participate in various engagement formats and d) a multi-stakeholder conference, discussing the initial results. The main output of the project will be a policy and practice guide on how to foster societal engagement under the terms of RRI. Be open towards outcomes – consensus as only one option, leave room for disagreement and establish provisions for possible conflicts. Explore new engagement settings: Possibilities of going to the citizens or stakeholders rather than inviting? SATORI (Stakeholders Acting Together On the ethical impact assessment of Research and Innovation), has developed an EU framework for ethics assessment of research and innovation. The European FP7 project engaged private and public stakeholders from Europe and beyond in an intensive process of research and dialogue. These included: ethicists from medicine, law, business, humanities, members of ethics committees, policymakers, science academies, professional organisations, research funders, industry, the media and civil society organisations. The project’s framework is a tool to strengthen ethics assessment overall, and facilitate responsible research and innovation (RRI). The project continuously aimed at involving the broad range of stakeholders mentioned above in all its workshops. The use of scenario workshops to tease out participants’ concerns and visons of future technology serves – in presenting concrete, predefined scenarios – to stimulate participants’ deliberations regarding how they envision the future. In addition, user stories of people living in the scenarios were developed to make the scenarios more tangible. While GoNano deals with complex technologies – and technologies and ethical issues which might be new to citizens – scenarios might be a good way to kick – start and qualify the debate. In addition, given that nanotechnology is a broad concept, scenarios might be helpful in narrowing the focus. As scenarios will steer the discussions and outcome considerably, it is important to consider them carefully. In the PACITA project, a group of diverse stakeholder representatives and experts were tasked with developing the scenarios in order to ensure that they reflected different views, possible developments in the technology, etc. The scenarios were developed based on professional stakeholders’ knowledge and perspectives. Hence, the scenarios were realistic and based on professional knowledge about what is technically feasible, while they reflected different experience-based perspectives on practical, social and economic needs. The workshop also left room for adjustment of the scenarios and for the development of new scenarios. This combination of predefined options and flexibility provided a fruitful starting point for the deliberations without constraining them. Task 1.3 of GoNano provides insights into relevant technological fields and potential future developments and issues – this data could serve as important input in the development of scenarios. As regards the representation of different perspectives in the scenarios, T1.2 and T1.3 offer some insights. The citizen workshop could also form the basis for the development of scenarios, which, in turn could serve as a basis for the first stakeholder workshops. The overall aim of CIVISTI (EU FP7) was to integrate different visions and ideas about the future to empower citizens’ perspectives on (political) agenda setting with respect to science funding at the European Commission. For GoNano, the development of the method is of particular interest as GoNano’s Pilot Studies borrow partly from this process with regard to citizen – stakeholder – interaction and workshop organisation. Framing: the aim of the deliberation process was decided upon in the framing stage. Furthermore, information material was developed for the citizen panels and a detailed process for the first citizen consultation (CC) was planned. Expert-stakeholder workshop deriving recommendations from visions: 18 experts and stakeholders worked for two days on deriving recommendations for future S&T from the citizens’ visions. The CIMULACT project aims to foster a more open research agenda sensitive to societal visions and values, needs and fears. The European Horizon2020 project engages European citizens in formulating visions for a desirable and sustainable future. Through a series of processes between citizens and stakeholders, these visions will be transformed into actual research policy topics and recommendations. These topics and recommendations will, in turn, be communicated to key policymakers with the aim of inspiring and shaping national and European research programmes. Exhibitions, catalogue and posters were used to communicate the outcomes of one phase in the next. CIMULACT acts as an example of how to process and use the outcomes of one workshop in the following.